A clutch connects and disconnects the engine from the gearbox (transmission) allowing smooth gear change and control of the engine power. A clutch plate (driven plate) is coated on both sides with a hard wearing high friction material. This is situated between the engine flywheel and a spring loaded pressure plate. The spring/pressure can be released by depressing the clutch pedal. We know from experience that it is important to assess the car before fitting a new clutch as many symptoms could indicate a problem with the clutch, whilst the real fault may be something completely different such as engine revving, a slipping fan belt or the need for a minor adjustment. If you notice any of the above then please get in touch and we will carry out a thorough check of your clutch to identify where the problem is. Depending on the nature of the problem we will either repair or recommend a clutch replacement. In either scenario we only ever use parts that match manufacturers' original specification and all of our clutch work is guaranteed. 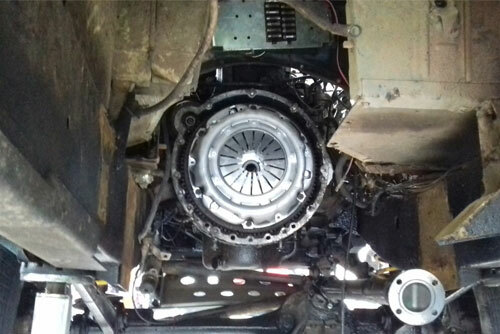 We are perfectly placed to deal with all modern clutch and transmission repairs. Contact us now for all you clutch repair and clutch replacement requirements.